He assumed charge as Director General, Indian Council for Cultural Relations and also holding the post of Secretary (Special Assignment) in Ministry of External Affairs. 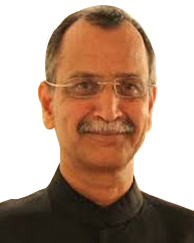 Prior to this appointment he was Dean, Foreign Service Institute on January 4, 2016, Ambassador of India to Argentina and concurrently to Uruguay and Paraguay from 2012 to December 2015 and Ambassador of India to Cote D'Ivoire (Ivory Coast) and concurrently as Ambassador to Guinea and Liberia and as High Commissioner to Sierra Leone from 2005-2007. He has also served as special envoy to South Sudan and Sudan to broker peace between the two countries.